The Livestrong LS 10.0T treadmill is one of the best sub-$1,000 treadmills you will find in the market today. It is beautifully crafted and offers features and quality not normally found on machines this cheap. If you are looking for an entry level treadmill that offers great value for your money, then you should definitely take a look at this Livestrong machine. Not only that, it also offers some of the best warranties in this price range so you know the company behind the product is confident of its quality. Livestrong LS 10.0T treadmill boasts of a 2.75 continuous horse power motor which is pretty impressive considering its price. It can reach speeds of up to 12mph and can be inclined for up to 12% so it doesn't matter what fitness level you're in this machine can offer you the workout that you're looking for. The 20" x 55" running deck provides enough space even for runners to feel comfortable while doing their workouts. This deck also comes with MaxComfort(tm) cushioning system to reduce stress on your joints while walking or running. The Livestrong LS 10.0T gives you variety in your workouts by offering numerous exercise programs. It comes with 12 training programs plus you can download exclusive Lance Armstrong-endorsed training programs for even more selections. LiveTrack(tm) performance tracker is another new feature being offered by the LS 10.0T and other Livestrong treadmills. It provides a way for you to journal and compare your workouts online without the need for paper journals or logs. As a result, you can easily and quickly measure the progress you've made. Other features include a workout fan to keep you cool during those hot workouts, a speed and incline toggles so you can easily change the intensity of your run and high quality speakers to keep you motivated and entertained during your exercise. 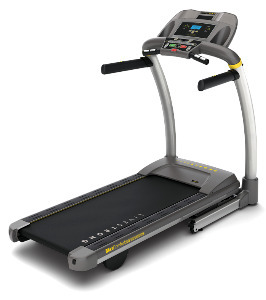 And finally, the Livestrong LS 10.0T treadmill comes with some of the best warranties being offered for a $1,000 treadmill. It offers a lifetime warranty for motor and frames, 3 years for parts and 1 year for in-home labor. Plus, this brand is being manufactured by Johnson Health Tech which is a firm known for great support. The only weakness I see is that Livestrong is new company and if things don't work out for them they could be gone in a few years. But luckily most parts used in manufacturing this treadmill are also being use by Johnson Health Tech in their other brands so finding spare parts shouldn't be an issue. The Livestrong LS 10.0T treadmill comes highly recommended. If you're looking for a budget treadmill in the $1,000 price range, this machine provides the best value for your money. However, if you don't think this is the treadmill for you then I suggest you visit our best buy treadmills page to look for other quality treadmills in different price ranges. If you plan to buy a Livestrong LS 10.0T, I suggest you buy from Amazon. You can get it for just $999.99.